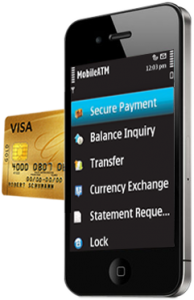 Secure and Fast Mobile Payments With MobileATM, a mobile number is mapped to bank account(s). The pay-ment amount willbededucted from the payer bank account to the recipient bank account, instantly and securely.Once the payer is authenticated, the payment goes thru and both payer and recipient are notified. And the Bank logs all the transactions as well.All this is fully encrypted and secure.With the MobileATM Secure Payment, no need for cash and no need to travel to the traditional ATMs to get cash. For a secure and fast way to make your payments through your mobile, Mobile ATM offers you the technology to link you mobile to your bank account(s) and insures a fast and safe transaction. Your mobile number will be mapped to your bank account, once a payment is made; the amount will then be deducted from your (the payer’s) bank account to the recipient’s bank account, instantly and securely. Once the payer authenticates the transaction, the payment goes through, and both payer and recipient will be notified and the Bank log all transactions. All this, is fully encrypted and secure. With the MobileATM Secure Payment, no need for cash or a trip to the traditional ATM.